It is a pleasure to welcome Colin MacDonald back to the salon, with a new piece on Marshal MacDonald. If Colin's article intrigues, please do visit his own wonderful site, where he has written on Marshal MacDonald in fascinating detail! The glittering history of France has provided us with no shortage of prominent military and political figures. Everyone can name at least one - Bonaparte - and those with a more specific interest can rattle off an endless list of other influential names such as Ney, Murat, De Saxe, Pontiatowski, Talleyrand and of course, Bourbon. There is one name however that is rarely mentioned amongst the highest echelons of French history and it is long overdue that the name MacDonald is brought back to its rightful place in the French Pantheon. This unlikely French-Scottish association refers to Étienne Jacques MacDonald, a man born to a Scottish father and French mother in Sedan. At the time of his birth in 1765, MacDonald had little future prospects of holding high office or aspiring to great riches. His father, Neil MacEachen, was an exiled Scottish Jacobite who had saved Bonnie Prince Charlie during the 1745 uprising but was now living in poverty amongst a community of Scottish exiles in France. MacEachen eventually changed the family name from MacEachen to MacDonald, most likely due to the French finding his original name too hard to pronounce. Although all Jacobites were pardoned by the British Government in 1784, Neil died in 1788 and never had the opportunity to return to Scotland. MacDonald followed in his father's foot steps by serving in a French regiment largely composed of Scottish and Irish Jacobite exiles. When the cataclysmic events of the French revolution began, MacDonald sided with the revolutionaries after being influenced by his wife's father, who was an enthusiastic supporter of the changes sweeping French society. These changes meant that men who previously had no prospect of advancement on account of their social status could now achieve success based on merit alone. As the European powers mobilised to destroy the French revolution in 1792, MacDonald was given ample opportunities to prove himself in defence of his new political ideals. He was present at many battles of the early Revolutionary Wars, including the great symbolic victory at Valmy, the battle largely credited with saving the National Assembly, leading to the execution of the king and therefore cited as one of the most significant battles in history. In 1793 MacDonald was already a Colonel and by 1797 he was a commander of a division in the French Army of Italy. He occupied Rome, becoming the Governor of the city, defeated the Austrian Army under General Mack before reorganising the Kingdom of Naples into the Parthenopaean Republic. In 1801 he became ambassador to Denmark, but disliked diplomacy and returned to France soon after. When he returned, MacDonald found France in the midst of a political crisis which nearly resulted in him becoming leader of the country. A coup was planned to overthrow the government and it was decided a General would be involved to secure the loyalty of the army. When the preferred military candidates ended up dead or unwilling to add their support, the decision fell to MacDonald who also refused to be the figurehead. The next choice for the conspirators was Napoleon Bonaparte, who accepted the role and seized power in 1799. MacDonald subsequently took control of the French Army of Switzerland but his career stagnated when he began associating with Napoleon's rival, General Moreau. It wasn't until 1809 that Napoleon made MacDonald the military advisor to his adopted son, Prince Eugene de Beauharnais, the Viceroy of Italy. The highlight of MacDonald's military career took place in the same year, when his unusual tactics at the Battle of Wagram resulted in a decisive French victory. A gushing Napoleon rode directly to MacDonald after the battle and made him a Marshal of France, the first French Marshal to ever be created on the battlefield. MacDonald was also given the hereditary aristocratic title of the Duke of Taranto and a reward of 60,000 francs, which he had distributed amongst his men. MacDonald's next major posting was to Catalonia, as the Governor-General of the principality and commander of the French Army there. He achieved mixed military success and returned to France after suffering from illness. In 1812 he commanded the northern attack of Napoleon's invasion of Russia, but after capturing Moscow the massive French army retreated and was decimated in the harsh winter conditions. Just 35,000 Frenchmen made it home from the initial force of 450,000. In 1813 MacDonald was present at the Battle of Leipzig when the tide turned decisively against Napoleon and the French forces. As the French front line gave way during the fight, MacDonald retreated with his men and almost drowned near the same point where Prince Poniatowski had also fallen to his death. MacDonald personally saw dozens of his own exhausted and desperate men drowning in the river as they tried to escape. Marshal MacDonald was said to have been forever haunted by the experiencing of his men screaming to him for help as they were swept away to their fate. Despite the decisive defeat at Leipzig, Napoleon held out hope that the French could still win the war, seemingly in denial at the overwhelming allied forces now advancing against him on every front. MacDonald, along with Marshals Ney, Oudinot and Victor personally met with Napoleon to convince him to end the now hopeless war. The Marshals convinced Napoleon to abdicate, thereby saving the lives of the remaining men of the French Army. France was soon occupied by Prussia, Britain, Austria and Russia and MacDonald developed a strong working relationship with the allied powers, particularly with Tsar Alexander of Russia. Louis XVIII met favourably with MacDonald when the Bourbon dynasty was restored to the French throne. MacDonald maintained a prominent advisory role to the king on military affairs, but the absent minded king neglected such affairs of state and MacDonald became increasingly frustrated with the King's failure to unite the country after years of division. MacDonald was to become a peer and member of the French Upper Chamber which on occasion led to direct confrontations between MacDonald and Louis XVIII. The king was often shocked at the direct and candid manner in which MacDonald addressed him, but over time he found this honesty endearing and would soon referred to MacDonald as 'His Outspokenness'. When Napoleon escaped Elbe and raised an army to retake the throne during the 'hundred days' of 1815, MacDonald stayed loyal to Louis XVIII, primarily out of a fear that the allied powers would inevitably win the war to come and enact a terrible retribution against France. Napoleon invited MacDonald to join him, but he refused, even if he was sympathetic to the concerns of his soldiers who now defected to Napoleon en masse. 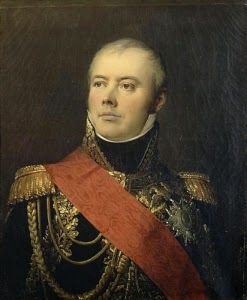 MacDonald personally led Louis XVIII to safety by taking him to the British Army that was present on the continent. Napoleon's final defeat soon followed, and MacDonald returned to Paris along with Louis XVIII. He refused numerous promotions, but eventually accepted a position in the French Government as Major-General of the King's Guard and Commander of the Army of the Loire. Secretly, he also assisted military officers who had been proscribed by the Bourbons by helping them escape from France. In 1825, MacDonald undertook a whirlwind tour of Scotland, England and Ireland. He met Walter Scott and visited his father's birthplace on South Uist. Fortunately for us modern historians, he left a reasonably detailed account of these adventures. His diary includes many frank and forthright descriptions of the people that he met, but this outward prickliness often masked his generous nature, which is all too evident in the financial assistance he offered some of his distant Scottish relations. MacDonald remained in French politics until the July Revolution of 1830 when Charles X abdicated in favour of Louis-Phillippe I. MacDonald chose this moment to bow out of politics, retiring to his Chateau of Courcelles le-Roi where he died in 1840. Evidence of MacDonald's extraordinary, yet largely forgotten career can still be found all over France. His name is inscribed in the Arc de Triomphe, his statue adorns the side of the Louvre and his portrait sits proudly in the 1792 room of the Palace of Versailles. MacDonald's career was characterised by loyalty and a steady dedication to his duty. He can best be described as dependable and diligent, rather than brilliant or particularly striking. This could be why he is often overlooked when compared with many of his contemporaries in the historiography that has developed after his death. Yet it is undeniable that Napoleon, Tsar Alexander, Louis XVIII and a large and varied group of other prominent figures trusted MacDonald to undertake roles on their behalf. The recognition due to MacDonald is therefore long overdue, not only in his home nation of France, but his ancestral home of Scotland. Written content of this post copyright © Colin MacDonald, 2015.